Have you heard it yet? Have you heard the boredom cry? Now that the kids have been out of school for a few weeks, has the novelty of being home worn off? Pretty normal that by this time, the kids might be wondering what to do with all their free time.This can quickly drive moms crazy. As parents we can worry that we have to entertain our children every minute of the day. But we don't. It is just as important for kids to learn to entertain and "be" with themselves too. Research shows us that our kids are amongst the smartest ever raised, but they are also one of the most stressed generations. 41% of children in a recent pole, feel stressed most or all of the time because they have too much to do. Children need time to do "nothing" so that they can decompress and experience the world around them. There are proven benefits to learning to deal with boredom. People who are ranked low on the "boredom scale" are found to do better in their education and career and to have a higher degree of self sufficiency. When it comes to unstructured time. 1. Encourage "daydreaming". It helps produce brain waves that boost creativity. Dont feel guilty if you don't have every minute scheduled for your child. 2. Take small steps. You can do this by setting aside a few minutes everyday that is unstructured. Have children play alone during this time. As they are better able to manage the unplanned time, increase this unstructured time as your child increases their ability to play alone. 3. Accept the messes. Kids entertaining themselves might mean a few messes to clean up. There might be craft supplies to put away, tents to take down, even "villages" to dismantle. As parents, we need to be okay with this. It is important that our kids learn these skills. It is their childhood. Don't worry about the messes. And, you can use it as a time to teach kids to clean up and put away. 4. Identify the problem. I'm bored means a lot of things. (For me it usually means I am hungry, or avoiding something I should be doing.) Get to the bottom of the problem. Think about some of the following questions. Is you child over-scheduled? Are they involved in too many things? Is your child addicted to electronics? They don't know what to do when they unplug. Does your child lack outside interests? Is your child trying to avoid tasks because they are too difficult or frustrating and use boredom as an excuse to get out of completing them? Does your child need more challenge? Activities could be too easy or predictable, not stimulating and uninteresting. Does your child want approval or feel neglected? Have you always planned everything for your child? They have never had to entertain themselves because you always do it for them? We want to empower our children with the skills they need to solve their own boredom. They will probably need a little help at the beginning, but with a little practice, they will get the hang of things. Here are some suggestions to get things started at your house this summer. Create a boredom box, or boredom list. Work with your children to write down all the things that they can do when they are bored. Small children can draw pictures of their ideas and suggestions. Add your own ideas and keep the box or list readily accessible. We have our own list that sits on our fridge. We have two lists, one list of things to do inside and then an outside list. This helps us whether it is Summer or Winter. When I hear the words, "Mom, I'm bored", I get the kids a snack and they sit down with the list. Our son and daughter can read, so they can pick their own activities off the list, our youngest can't read yet, so I made her a list that only had pictures. She loves to look at the list and choose her favorite activities. Read. Do all you can to get your kids to read. Check out books at the library. If they like sports, let them read the sports page, if they like to cook, like our daughter, let them read cookbooks. Reading anything is great. For Christmas every year we give our children magazine subscriptions to children's magazines. A new issue comes every month and they read them over and over. It gives them something to look forward to and because they are interested in the subject, they really get into reading them. We always do a reading program in the summer too. Our local library gives out a reading calendar that is always fun. And, this year we are using this fun summer reading printable. It is a free download and the kids are really excited. Help your child find a hobby or interest. This wont take long. Children love to learn. Sometimes they just need a little help exploring the possibilities. Help your child find something they are passionate about and then give them the tools and skills to support the passion. Bugs, books, art, sports, anything. Even if it is not your passion, encourage them. Encourage creativity. Always have art and craft supplies available. We have a basket that holds all of the supplies that our kids can use themselves. When ever I finish a paper towel roll, or find random ribbons or bobbles that I don't need, I put them into the basket. It is filled with all sorts of randomness. At first it was hard for me to keep "things" that I wanted to throw away. Then I designated a space in our home to hold the "things" and it has made a huge difference for me and with our children. They help themselves to the supplies and are constantly creating pictures and sculptures and villages. Have a costume box. Kids love to dress up. Fill it with anything and everything that they could wear. They will get creative and have a great time playing make believe. Encourage tents and and forts.This one was also hard for me at first. I didn't always want the forts in the middle of the family room. We designated what blankets and pillows and areas could be used to make forts. It made things easier for me and for the kids. We also set guidelines for how long the tents can be up. The kids know they can build all they want, but at the end of the day, after Daddy has come home from work and seen what they have built, that they have to clean up also. Teach children to have patience and wait. Kids today, like a lot of adults, want instant gratification and constant stimulation. When there is nothing entertaining them, they don't know what to do. Encourage them to do projects that can be stretched to longer than one sitting. Simple ways to do this: Have them start by drawing one picture, and then over a few weeks increase that to drawing a few more pictures. Then have them put words to their pictures, then bind the pages to make a book. Puzzles are great also. Start with a 25 piece and increase little by little, 50 piece, 75 piece etc. Reading chapter books, for older children, is also great. Plan ahead to teach patience. Make a family calendar and fill it with some fun things you are going to do this summer. Schedule them on the calendar so that kids can follow along and learn to understand how we have to wait to do things. Cut back on electronics. Parents and children are always quick to use T.V, video games, computer time, as a solution to the bored problem. These electronics actually keep kids from being resourceful and creative. Like we mentioned last week with the technology post, set limits on electronics and enforce the limits. Rotate toys. If your children complains that they are getting bored with their toys, rotate them. Every six months I take toys and put them away. Then, six months later I put the toys the kids have been playing with away, and pull out the toys that have been packed away. My children think it is Christmas. They are so excited to play with the toys they haven't seen for awhile. It keeps them interested and gives them new things to play with. As parents, we need to be willing to play with our kids. It is vital to their development. But, It is also important to teach children how to entertain themselves. Seek out a healthy balance to raise children who can focus, imagine and create with you, and on their own. 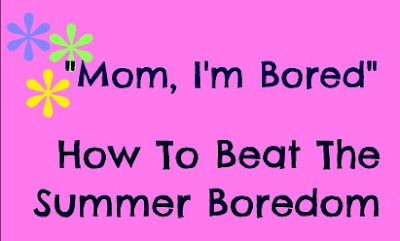 If all else fails, when the kids start to complain about the boredom, suggest your kids do work around the house or yard work. Don't worry, they will very quickly find something to entertain themselves. Ha! Need some fun new games and activities for your kids. Buy the Family Fun Friday Game/Activity and your kids won't be bored again. You can click on the red button that says "Buy the Book". Top right of the page. Hours of fun entertainment for your kids and your family. Are your kids complaining about boredom yet? Great ideas! My kids especially love to build forts! These are some really great ideas for the "summer boredom' dilemma. It seems like the kids want summer vacation so bad, but as soon as school is out the 'I'm bored' comments start. These are great idea. I have found if I give my kids a list in the morning of chores and some school work to do, then I don't hear the bored till later in the afternoon. I also don't let them have computer or WII time unless they earn it by doing extra chores. Then they are motivated to help me to keep the house clean. These are awesome ideas :)! I love the boredom box! So fun! My boy is too little for this but when he is big enough to understand ill have to remember this post! One thing that I love doing is work on a fun summer bucket lists for when they are bored... I've done things with niece and nephew that were super simple and they loved it. Awesome post :)! Love the idea of giving your child or children some down time.. Children today seem to need something to do 24/7. Children don't know how to sit still and be creative.. Their imaginations are not being developed to the point of dreaming of wonderful unusual things. Years ago children had a great time playing with their toys. Today 's children have all kinds of toys that done let them use their imaginations . Hi-Tech toys that do the thinking for them. So very sad!